Federal Tuition Assistance (FTA) will pay for up to 16 semester hours a year with a $250 cap on each hour. You can use FTA with other programs to cover up to 100 percent of your tuition. Click Here for the GoArmyEd Website. Student agrees to accept a commission as a Second Lieutenant and serve for not less than four years as a commissioned officer in the Kansas Army National Guard. This program is only available at Kansas State University, Pittsburg State University, University of Kansas, Washburn University and some community colleges. 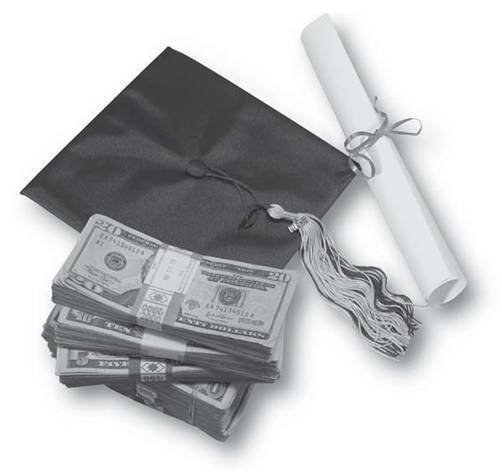 Click here for more informaton about these scholarships. Find information about the SAT and ACT, graduate school exams, and tests that can help you earn academic credit for civilian and military experience (the CLEP, DSST and Excelsior exams). The Guard can also help pay for many of the tests to further your education. If you have questions or would like to schedule a test, contact the Education Services Office at (785) 646-0155. This program repays existing, qualifying student loans up to $50,000 for new Soldiers, prior service Soldiers, and officers who qualify. Contact Master Sgt. Amy Umbarger at (785) 646-0157. The Education Services Office can provide information to help find a school and a degree program that meets your needs and aspirations. Factors such as program flexibility, having a military friendly atmosphere, acceptance of transfer credits and credit-by-exam, and a willingness to accept military training and experience all come into play when planning out a civilian education plan. The Education Office can help! Call (785) 646-0155. We can help you use your benefits to ensure that you meet your education goals as easily as possible. We will show you what benefits are available to you, as well as how to apply for them. We will show how to combine certain benefits and which programs should be used for different levels of education. GI Bill programs are administered by the Department of Veterans Affairs (VA), however the Education Services Office has subject-matter experts that can assist with the use of these programs. All of the GI Bill programs require certain qualification measures to be met. These measures are usually determined by the Department of Defense, and this is another place that the Education Services Office can help. Please contact us with any questions. Click Here for the GI Bill Website. This is an education assistance program for individuals in the military reserves or National Guard. It pays a monthly benefit to those who qualify and apply while the student is going to school. This program provides assistance to those who served for a specific time frame in the Active Duty military on or after July 1, 1985. It pays a larger sum than the select-reserve GI Bill during the school year to those who qualify. To qualify for this assistance, you must have been a member of the Ready Reserve (including National Guard) who was called to Active Duty on or after September 11, 2001. This program is for those who served at least 90 days of Active Duty service on or after September 11, 2001. It can cover up to 100% of tuition and some qualifying fees, depending on how much time you served on that Active Duty. Qualifying individuals may also be eligible for a housing allowance and a book stipend to assist with their education costs. This is the only benefit that can be transferred to a spouse or child. If you are a current member of the military, you may qualify to transfer Post-9/11 GI Bill to children or spouses. The ability to transfer is based on time served, agreement to continue to serve, and the ages of children. Contact the Education Office to find out more! Or click here to find out more.